I tend to gravitate towards artists and authors with a checkered past, scoundrels, including Casanova, Rabelais, Caravaggio, Knut Hamsun, and Henry Miller, to name just a few. Years ago I inherited a small private library and within it were a number of novels by Frederic Prokosch a 20th Century American author. The books were in terrible shape, many missing a dust jacket, if the dust jacket was there, it was in tatters, the books generally smoke damaged and tired. I kept the books anyway, planning someday to browse through them to gain some insight into why my dear Uncle seemed to so in love this particular author. At the time, my intuition was that Prokosch was an immigrant to America and English was his second language, an author class, my Uncle revered. A few days ago I finally decided to dip into the Prokosch novels and became more educated and very glad I did! Frederic Prokosch was born in 1908 in Madison, Wisconsin and died in 1989 in Plan de Grasse in the Alpes Maritimes in France. He studied at Haverford College, Yale and King's College, Cambridge. He was an instructor at Yale from 1932 t0 1934 and served as a cultural liaison for the American Legation in Stockholm during World War II. After the war, he settled in Rome and became a lecturer at the University of Rome. The author of 16 novels, four books of poems, a memoir, a book collector himself, and a publisher in his own right of limited edition pamphlets, he was considered a master of his craft from 1935 onward. Prokosch impressed such 20 Century literary lions as Thomas Mann, Andre Gide, T.S. Eliot and Albert Camus and from my limited recent experience his writing remains fresh and relevant today. Prokosch contributed to book collecting lore by creating a forged set of pamphlets he tried to pass off as originals. This "prank", which Prokosch did eventually confess, was memorialized by noted book historian and collecting detective Nicolas Barker in his book, The Butterfly Books: An Enquiry into the Nature of Certain Twentieth Century Pamphlets, Bertram Rota, London, 1987, 400 copies, hardcover, 400 pages(four copies are available here). Prokosch, between 1932 and 1960, did indeed, design and print a number of pamphlets of his and other famous author's poetry. Upon publication, these rare publications were often sent to the original author as a Christmas gift and few were ever found for sale in the general marketplace. For some reason or other, in 1969, Prokosch hired a printer in Paris to print new copies of his original pamphlets which he then tried to sell as the originals. A book collecting scoundrel is born! Since he did confess to the forgery, at his death, his reputation was not tarnished and his questionable publishing history known only to the select book collecting community. Today, the original Butterfly Books remain rare but a few are still available and I can't find any of the forgeries for sale. The lack of attention to Prokosch now suggests that he is more a forgotten rather than revered 20th Century American author. I've started reading the 9 novels I have in my private library and so far, I am impressed and enjoying the effort. In fact, I remain frustrated that the nine books I own, are in poor condition and a nagging voice in my head tells me that to honor, both my Uncle and Prokosch, I ought to set about collecting fine condition copies! Yet another want list to create but first, I'll simply enjoy his writing. If you are interested in collecting Prokosch I'll list a few highlights which I believe would create a enjoyable reading experience and a fine set of books to add to your library. The Asiatics, by Frederick Prokosch, Harper & Brothers Publishers, New York and London, 1935 was his first published novel. Sometimes referred to as the first, geographical novel, Prokosch presents a rousing and original introduction to all things Asiatic via a fictional travelogue, Lebanon to Hanoi. Since only a few first edition, first printing copies are availablea more recent paperback edition has been published by Macmillan with an introduction by Pico Iyer and would be a fine reading copy. 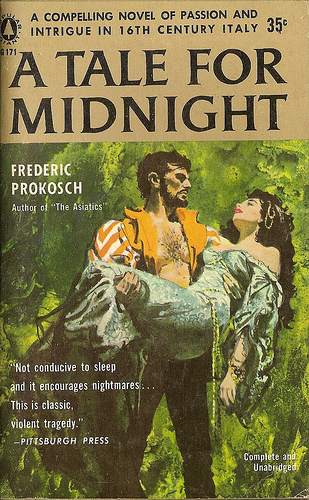 I just finished reading, A Tale for Midnight, by Frederic Prokosch, Little, Brown and Company, Boston/Toronto, 1955 and loved the experience. In this historical novel, Prokosch retells the story of the Noble Roman Cenci family at the center of a horrible patricide and ensuing investigation, trial, confession via the rack and execution in the 16th Century. The novel takes place in the Abruzzi region of Italy, close to where my Mother's family comes from, and the Rome of Clement the 8th. A Time Magazine review from 1955 is a solid teaser. I'm now reading Nine Days to Mukalla, by Frederic Prokosch, Viking, New York, 1953 (Seckler and Warburg, London, 1953). In the aftermath of a plane crash, four travels brave the seas and sands trying to get from an unnamed island in the Indian Ocean to Mukalla, Yemen where they hope to continue to their original destinations. The experiences of the four (2 American men, 2 British woman) on the way to Yemen is filled with ancient fears and modern cultural differences. So far, I'm hooked and the mass market paperback cover suggests that starting small Prokosch first edition paperback release collection would be amusing! Prokosch lived a life of mystery and his legacy as an American master appears at risk. His memoir, Voices: A Memoir, Farrar, Straus, Giroux, New York, 1983(Faber and Faber, London, 1983) is more a fictional biography and collection of supposed conversations Prokosch had with artistic giants of his era. Later, doubt was cast on Prokosch's claims to have had any of the conversations he included and his memoir suggests a second forgery, this time of his life's memories. Regardless, so far, I'm finding his writing worth the effort and his insight into our modern, more global, culture of great interest. Thanks so much for this effort. I look forward to more of your posts on Prokosch, whose relative obscurity baffles me, as I think he's among the most interesting of 20th century American authors. I've enjoyed everything I've read by him, and count "The Seven Who Fled" among my favorite novels. 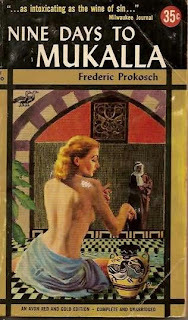 Frederick Prokosch is one of my favourite authors. I've been reading his novels since my early teens (I'm now 70) and came across "Storm and Echo" which one of my parents' Book of the Month Club books. The richness and lushness of his language and descriptions still touch me. I re-read many of his books just to immerse myself in the worlds he re-creates. My favourites continue to be "Storm and Echo" and "A Ballad of Love". I have all of Prokosch's novels. I first found him with "A Ballad of Love" and was so struck by the beauty of the writing that I collected everything, all 16 of them. I still read them occasionally, especially "A Ballad of Love" and 'The Wreck of the Cassandra.." His language never ages. Surely, one day his reputation will bloom anew. I just acquired "The Asiatics"today,in "The albatross modern continental library",published in Italy in 1947 with the mention"Not to be introduced into the British Empire or the USA"!HA!ha!!ha! I discovered "The Missolonghi manuscript" after having read I don't remember whom deploring the lack of interest for this author.I am hooked. Hi, I just found a 1948 signed first edition in a box with a lovely picture, of Storm and Echo, which i believe was my grandmothers. Its signed and says the first 85 copies were signed, of which this is #42. She had MANY first editions, but not so many signed. Do you know anyone who might be interested in this item? I inherited 1000+ books from her and can't keep every one. I writing my biography of John Dickson Carr, I corresponded with Prokosch shortly before his death. He and Carr were contemporaries at Haverford college, and at least his memories of Carr in VOICES were accurate, though apparently other things were invented. It also helps learn the fine nuances of writing in a particular genre and what works best in that genre. Reading the works of other writers also helps a writer take a fresh perspective on a given topic.